Wellington Wind Symphony concert-goers are familiar with the wide range of repertoire that the group performs, from transcriptions of orchestral works to original compositions. 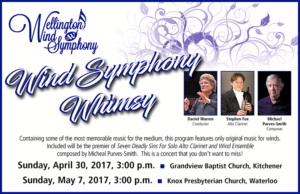 Our next concert Wind Symphony Whimsy, consists of music all written originally for wind ensemble by some very accomplished composers. It covers a wide range of musical styles and contains some great music that can only be performed by a group like the WWS. 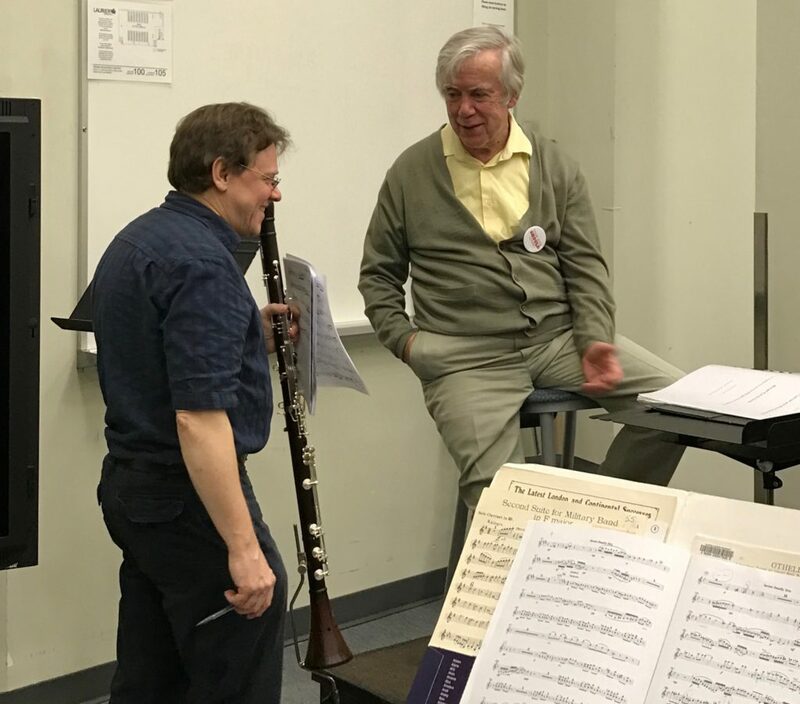 Alto clarinet soloist Steve Fox conferring with composer Michael Purves-Smith. The concerto for this concert, entitled The Seven Deadly Sins for alto clarinet and wind ensemble, is perhaps the only concerto for this combination in existence so far, and was written by noted Canadian composer and WWS music director emeritus Michael Purves-Smith. The featured artist is Stephen Fox, one of Canada’s leading clarinet soloists. He will be performing on an alto clarinet, with a stunningly lovely sound, that he himself built. Getting to know this surprising instrument is reason enough to pique one’s curiosity.